I have been very pleased that the devotion has gone so well. Putting on the Forty Hours is daunting in a one man parish, but my parishioners have really responded generously, making me enthusiastic about holding this every year. I would go so far as to say that it is one of the best things that I have done in 25 years of priesthood. It is a great blessing for the parish and would recommend any parish priest to consider trying it. A spin-off for the priest is that you get to say all your office, meditation and rosary before the Blessed Sacrament exposed. I enjoyed the thought earlier tonight that I was saying Matins and Lauds at the same time as the Carthusians; not that I took as long as them, mind you! 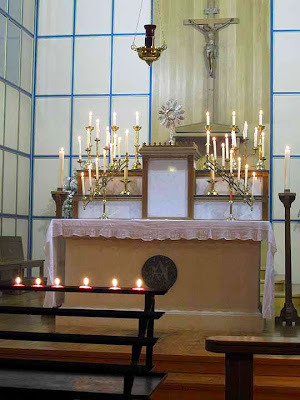 As it is usually done now, the Forty Hours starts with evening Mass, carries on over two nights and one full day, then finishes with a morning Mass. We have used the older form of Mass (in addition to a newer form Mass this morning); that is not essential, of course (though it is rather special.) In any event, it is good to celebrate the Masses with some solemnity, the use of incense and torches and so on. I am taking notes during this year's devotion so that we can make it even better next year. One thing to watch is the care of the candles. Today, during the day, I was a little bit late on one occasion and had to do quite a bit of scraping wax out of candle holders when some of the candles had burnt down too far. On a less pedestrian note, it occurred to me that it might also be a good idea to sing Compline some time after the evening Masses. There was a good number of confessions after Mass this evening so that is something to put in the schedule too. My good friend Fr Stephen Boyle currently has the Forty Hours at his parish of the Good Shepherd in New Addington. The other day he told me ruefully on the phone that his runs over Saturday night: the clocks go back on Saturday so they have an extra hour of watching during the night. The above photo is from Mulier Fortis. She has some more pictures from last night and I expect more will be forthcoming from tonight and tomorrow morning.